Dussehra or Vijaya Dashami is the tenth day of the Navaratri festival. It calls an end to the festival and is often considered symbolic of victory of the good over evil. It is also evident of a new beginning. 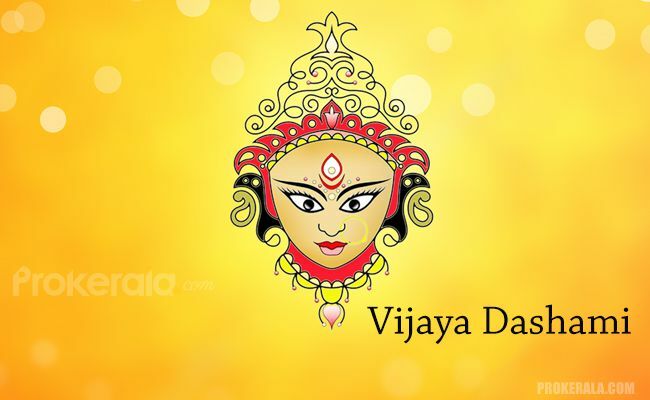 When is Vijaya Dasami celebrated? It is celebrated on the tenth day of the Shukla paksha of the Indian month of Ashwin. According to the English calendar, it falls in the months of September-October. Do you know what colour to wear on each Navratri night? Take a look! It marks the day on which Lord Rama achieved victory over Ravana, the ten headed demon king of Lanka. This day is also symbolic of the end of Mahishasur, the king of demons whon was killed by Goddess Durga on this day. According to mythology, Durga was created by the Gods by pooling in their spiritual powers as they wanted to create ‘shakti’ that was ultimate and could annihilate Mahishasur. This day is marks the journey of Goddess Durga back to Kailash after ten days of stay at her parent’s house on Earth. Every year, Mother Durga visits her paternal house along with her four children—Lakshmi, Saraswati, Kartikeya and Ganesha. She is also accompanied by two ‘sakhis’ or friends—Jaya and Vijaya. Vijaya Dashami also marks the victory of the Pandavas over the Kauravas in Mahabharata and the end of their exile. In India, it also marks the beginning of the harvest festival. In North India, Vijaya Dashami is celebrated as Ramlila. On this day, large effigies of Ravana, his brother Kumbhakarna and his son Meghnath are burnt in huge fairs in front of large crowds of spectators. These effigies are filled with different types of fire crackers and theatres are held depicting the story of how Lord Rama achieved victory over Ravana on this day. In Southern India, this day marks the end of Golu---a festival celebrated in Tamil Nadu, Karnataka and Kerala. Goddess Durga is worshipped in the form of Devi Chamundeshwari during this phase. Also, children are introduced to formal education in schools on this day. This is preceeded by the worship of books on the Navami day. This puja is known as Ayudha Puja. In some areas of Andhra Pradesh, there is an age old custom of giving Shami tree leaves to elders as mark of respect. Other significant events include Theppotsavam—the boat festival that is held during this time in the River Krishna. In Kerala, Vidyarambham is celebrated on this day where small children are introduced to formal education by making them write their names on a rice platter with the guidance of an elder member of the family. In West Bengal, this day is celebrated as the last day of Durga Puja. Idols of Goddess Durga are immersed in the water thus marking the Goddess’s homeward journey to Kailash.